Pointed blade in one-hand, ratcheting RSP2 helps start the cut in tough plastics and helps avoid bounce in thin wall material. V-shaped cradle supports pipe giving 3 touch points - 2 at bottom and main one on blade. 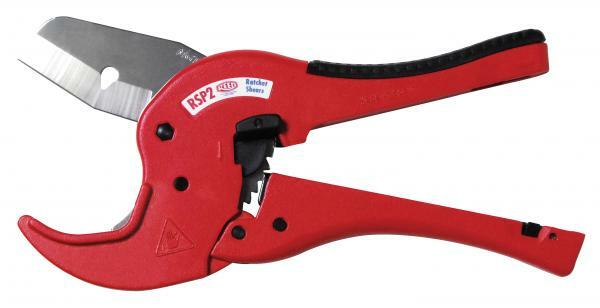 Hardened steel blade makes RSP2 ideal for cutting PE, PP, PEX and ABS. Quick release lever to open blade, along with safety latch to keep tool closed when not in use. Sharpen or replace blade for best performance.